Knocking the reader out of the story is something writing mentors warn writers to avoid. I think the concept is one of those nebulous notions that has no clear definition beyond causing the reader to think outside the parameters of the story. I don’t know how to know if something I write knocks the reader out of the story. When reading other stories, I sometimes experience moments of pause and ponder that might be considered knocking the reader out of the story, but those moments do not harm my experience of reading the story. 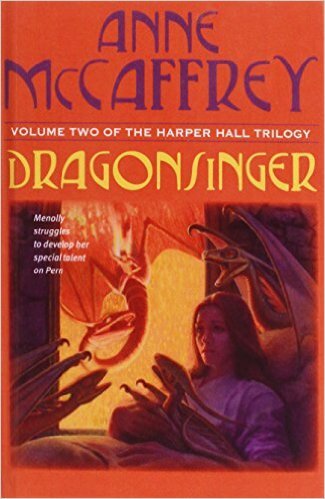 One such moment occurred when I read the above line of dialogue while reading Dragonsinger. It caused me to stop and think. I felt it was addressed to me. I am suffused with self-doubt. I shouldn’t be. I still have much to learn, but I am good at what I do. I must accept that and not let my doubts or modesty limit me. Because I stopped reading and began contemplating, was I knocked out of the story? I don’t think so, but if that is knocking someone out of the story, I think it is something to strive for. I want occasionally to make the reader stop and think. On the other hand, horrible sentence structures, bad grammar, spelling errors, typos, etc., also knocks the reader out of the story. Those kind are bad. Don’t do those.